wbe.travel has built a complex range of mobile tools for you to get extra revenue for your travel businesses from the online market: a user-friendly website interface, optimized for multiple mobile devices and a state-of-the-art B2C Mobile Booking App for your clients to access and enjoy the same features you have on your website. Our mobile solutions, tailor-made for the travel industry, offer a fully secured interface and fast access into a responsive, up-to-date designed website that drives incredible sales force from global web and mobile users which can rapidly search, book and manage their bookings anytime, anywhere and from any device. Adding a mobile optimized website or a downloadable Mobile App in 11 languages translates into extra income, more bookings on top of your current business. 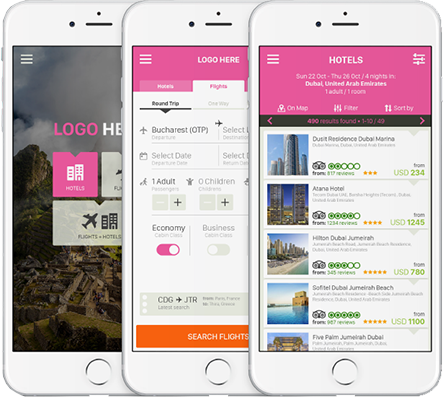 wbe.travel has developed a downloadable iOS or Android Mobile App that comes with an attractive User Interface and provides a seamless and fast booking experience for you and your clients. The Mobile app is developed in 11 international languages: English, Arabic, Chinese, Korean, Japanese, Hindi, Indonesian, Malay, Portuguese, Spanish and Russian. WHAT’S SO GREAT ABOUT WBE.TRAVEL MOBILE SOLUTIONS ? Low Cost Carriers (like Mystifly, Pyton, TravelFusion). It offers immediate search results and OTA-like user experience for all of your clients. It follows your corporate image (logo, fonts, colors and your name in the App Store). wbe.travel has an accessible and easy to use software for the daily operations. Effective features and updates. wbe.travel offers a user friendly system and the latest technology.